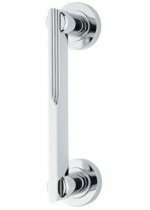 Veronica Italian designer art deco style door lever handles produced to the highest quality standards in hot stamped brass. 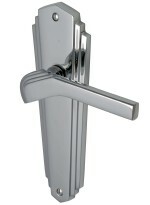 Available in Polished Chrome & Satin Chrome. (3 to 4 week lead time on satin chrome). Handle length=120mm, projection=61mm, back rose=51mm. Supplied in pairs complete with all fixings.